VSC Technologies is a subsidiary of the French National Railway Corporation (SNCF) under the SNCF online travel agency, Voyages-sncf.com, which handles long-distance and high-speed passenger services. Based near Paris and employing more than 170 people, VSC offers complete technology solutions and services for the railway distribution needs of its customers and hosts critical applications for railway reservations. In 2009, Voyages-sncf.com managed a business volume of 2.4 billion€, with more than 10 million unique visitors per month. To handle the volume, the VSC team needed a benchmark platform to improve their new strategic software project—a data warehouse application used in a transactional context and refreshed in near-real time to model large volumes of business transactions. Their usual provider required eight months to deliver the platform. When VSC partner Ysance recommended Amazon Web Services (AWS) as an alternative, VSC jumped at it. AWS was integrated as a test platform through Amazon Elastic Compute Cloud (Amazon EC2), Amazon Elastic Block Storage, and Amazon Simple Storage Service (Amazon S3), and VSC customers used the platform for performance testing during development. 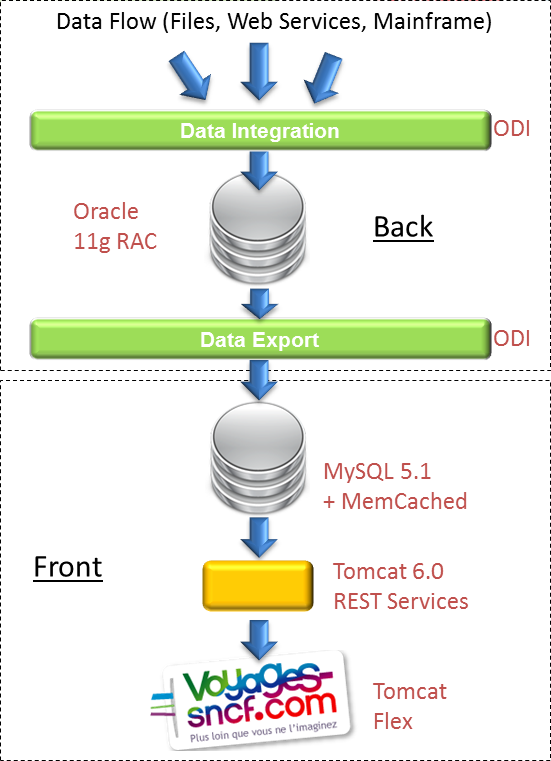 The test platform was identical to the target service platform, with Apache Tomcat and MySQL in the front-end tier and Oracle, Oracle Data Integrator, and several Java batch applications in the back-end tier. The application was benchmarked with Apache JMeter and Apache Cactus. The VSC team found that they needed to adapt to different hardware performance when changing platforms to AWS. They learned to be flexible in application design and less dependent upon visibility into disk and network I/O performance. VSC Technologies deputy general manager Pierre Matuchet likes the simplicity and flexibility of AWS. In particular, Matuchet cites the exceptional time to market, because AWS allows VSC to test its new service three months before rollout, as opposed to only one month with its usual provider solution. Matuchet also points out that AWS reduces risk on the IT infrastructure during delivery. The success of their test platform using AWS inspired the VSC team to plan a proof of concept to extend their development infrastructure for more complex applications, including a link to the mainframe and more transactional databases.